On Monday, just moments after the Associated Press reported that Ted Cruz had won the Iowa caucuses, Mike Huckabee dropped out of the presidential race. "I am officially suspending my campaign. Thank you for all your loyal support. #ImWithHucK," Huckabee tweeted. The announcement came as no surprise: Huckabee had said publicly that he planned to drop out of the race if he hadn't placed in the top three in the Iowa caucuses. As of the time the former Arkansas governor dropped out, Huckabee had come fourth from last place, not including "Other," which had beat out Jim Gilmore with approximately 0.1 percent of the vote. "If we can't come within striking distance of the victory or win it, then I think we recognize that it's going to be hard to take that onto the other states," Politico reported that Huckabee told host Simon Conway. However, The Des Moines Register reports that Huckabee had told a group of supporters over the weekend: "I'm not getting out of the race ... I'm staying in and I'm going to do great tomorrow night and keep going and win the White House." Cruz beat out frontrunner Donald Trump, with Marco Rubio coming in third place. The top three took the majority of the vote, with fourth-place finisher Ben Carson coming in with less than ten percent of the vote. 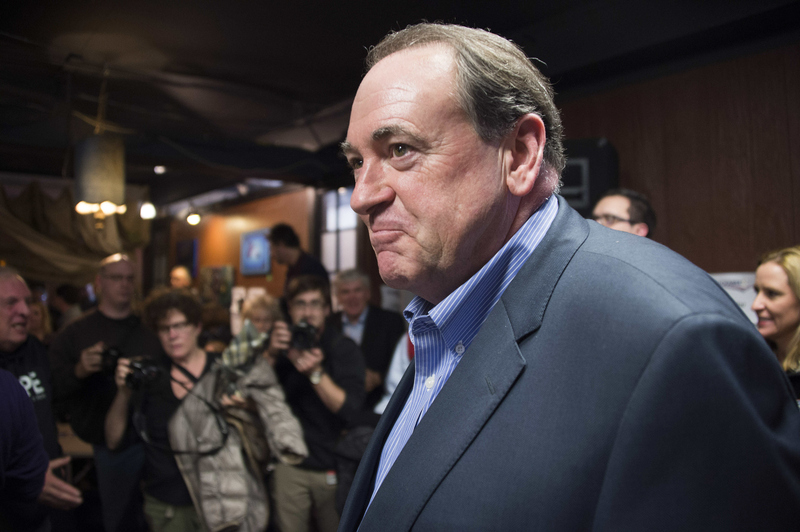 Huckabee had announced his second presidential run in May.